Rehm: Now I know you’ve been listening since the top of the program, and I’m sure you’ve heard James Fallows talk about lies that Donald Trump has put out there in tweets, in things he’s said. What do you make of that? 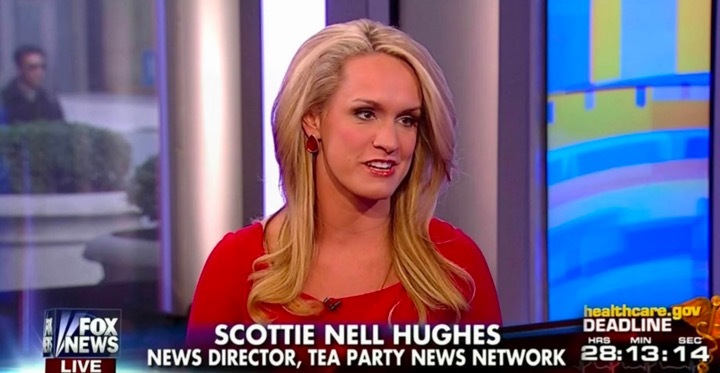 Hughes: Well, I think it’s also an idea of an opinion. And that’s — on one hand I hear half the media saying that these are lies, but on the other half there are many people that go, no, it’s true. And so one thing that has been interesting this entire campaign season to watch is that people that say facts are facts, they’re not really facts. Everybody has a way, it’s kind of like looking at ratings or looking at a glass of half-full water. Everybody has a way of interpreting them to be the truth or not true. 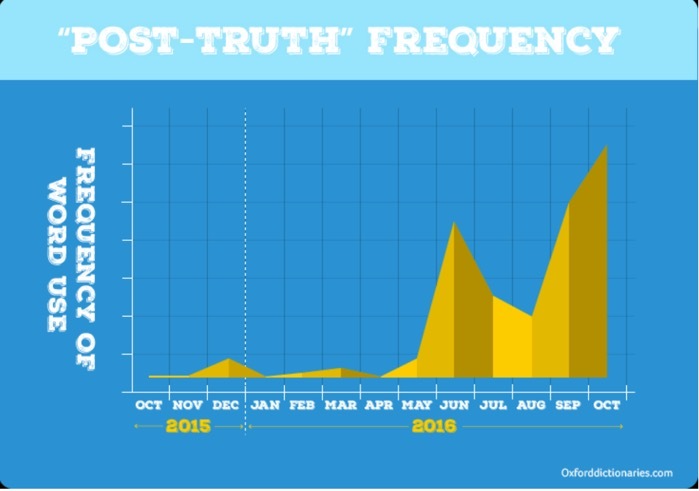 Is post-truthism a peculiar and ugly side effect of the 2016 presidential campaign? Yes and no. Certainly, anti-intellectualism has long been an observable part of U.S. history: the road from the Know Nothing Party to McCarthyism has been well traveled. Nor is the rejection of observable facts (only) a contemporary malady. As educators trained to pay attention to historical realities and to raise critical questions about them, we should keep in mind that for many members of the U.S. community, the willful and persistent denial of facts all too familiar. To cite only two examples: On December 6, 2016, a jury of six white men, five white women, and a one black man was unable to come to a unanimous decision that a police officer unlawfully killed Walter L. Scott, a black man who had been pulled over for a broken taillight. This is the case despite the existence of a video that recorded how Scott, who was running away, was shot in the back some 17 feet from the officer. If this stirred memories of the Rodney King trial, it should have. A video showing Rodney King being unmercifully beaten by the Los Angeles police in 1991 was not accepted as fact in the officers’ trial for assault; all were acquitted. As Jelani Cobb recently observed, “Taken in total, the reluctance of juries to hold police accountable is an inversion of the ‘fake news’ crisis in the Presidential election. There, a gullible public believes outrageous claims that reaffirm its world view. In the criminal-justice system, as black America has long known, an indifferent public sees evidence of outrageous actions but chooses not to believe it in order to preserve its world view. We have moved far beyond facts.” Large parts of white America have never accepted many of the facts that smack black Americans in the face every day. Perhaps we can take a small morsel of consolation from the fact that the truth-crisis that surrounded the election of 2016 can’t be deposited on higher education’s doorstep. 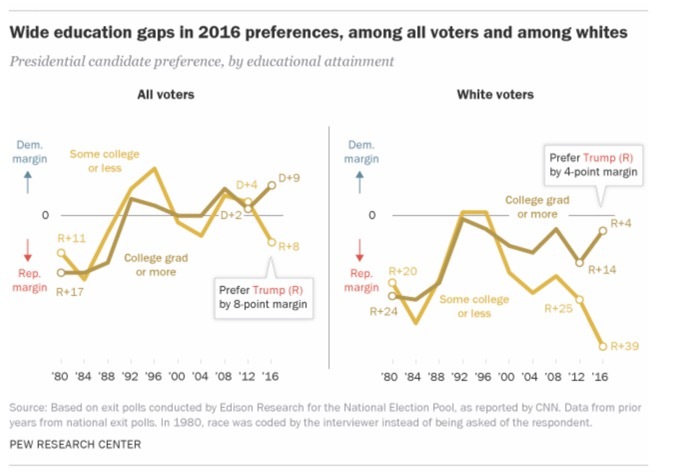 After all, Clinton carried college graduates by a 9-point margin. And yet I have felt unnervingly at sea writing this post because my arguments, conscientiously authenticated by links to authoritative sources, would only serve as proof of their irrelevance, if not contemptibility, in the eyes of millions of voters. If Mr. Trump were to tweet that he actually received more votes from the college educated than his opponent, his claim would be accepted as truth by many, if not most, of his supporters. So, what is our role as classroom teachers, members of institutions of higher education, and intellectuals who are also concerned citizens? The past few weeks have produced a profusion of commentary about how those of us in academia should situate ourselves in the post-truth world of President-elect Trump. You can read some general propositions about the stance to take here, here, or here. You can read statements that many college presidents have signed on to. You can investigate the sanctuary campus movement, or take advice as to how we should react to threats to academic and intellectual freedom that can emerge when Trump takes office (and have already emerged in the transition period). (1) Take even more seriously the task of helping students evaluate sources of information. Nicholas Lemann, a professor of journalism and former dean at Columbia, recently made the case for a new kind of core curriculum that includes “information acquisition” as the first item in the list. We can argue about the value of a core curriculum later – an argument I’d relish – but now the focus is not just on our long-standing responsibility to teach “information literacy,” but on the consequences of not taking that responsibility seriously. For those who seem to think that our students have no trouble identifying credible information sources, think again. Stanford University’s History Education Group recently tested nearly 8,000 students for “civic online reasoning” skills, i.e. the ability to assess the credibility of information served up by smartphones, tablets, and computers. From January 2015 through June 2016 the group collected and studied responses from 7,804 students from 12 states. The schools ranged from “under-resourced” inner-city schools in Los Angeles to “well-resourced” suburban schools in Minneapolis. Testing in colleges ranged from large state universities with near-open enrollment, to Stanford University. What they found was that more than 80% of the tested students couldn’t tell the difference between real news articles and fake news. For those of us who teach at selective liberal arts colleges, our concern as educators is not – or not solely – that our students are likely to be sucked into the dark vortex of whole-cloth fabrications whose most recent poster child is the Comet Ping Pong insanity (although the fact that such invented conspiracies are being circulated by an important member of the incoming Trump administration, should lead to much concern). Only a few students noted that the tweet was based on a poll conducted by a professional polling firm and explained why this would make the tweet a stronger source of information. 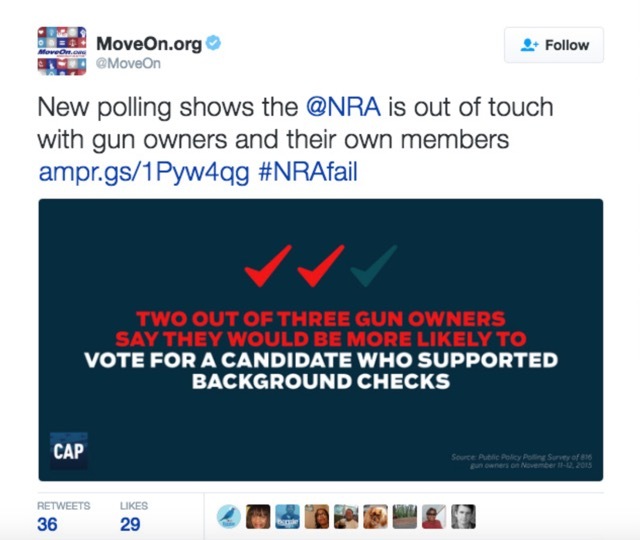 Similarly, less than a third of students fully explained how the political agendas of MoveOn.org and the Center for American Progress might influence the content of the tweet. Many students made broad statements about the limitations of polling or the dangers of social media content instead of investigating the particulars of the organizations involved in this tweet. Faculty have work to do, in close partnership with our libraries, about basic online information literacy and cannot assume that our students have a sophisticated understanding of how information is generated in a content zone that has developed outside academic or journalistic oversight, as limited as that might be. Nor is the problem lessened because our students aren’t likely to submit as evidence data that originate on white nationalist sites. We need to ask whether we are we equipping students to bring the same critical eye to more liberal media sources. Do they know what questions to ask about information sources and how to answer them? We need to develop new and sustained ways to help students navigate this information world. We need new courses in information literacy and the funded development of media literacy segments for on-going courses in the regular curriculum. 2) Help students understand (and question) the unspoken authority of the text. 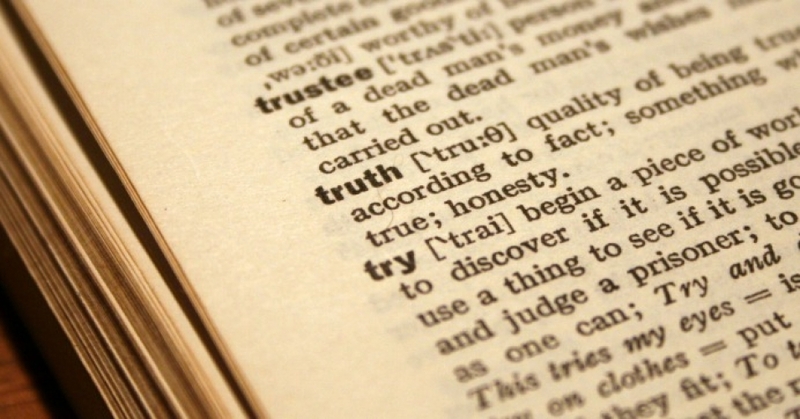 If we are not to spend the next 40 years wandering around in an epistemological desert, where all utterances are judged to be as valid (truthful, factual) as any other, we need to help our students understand where the authority that underlies knowledge comes from – and that means being able know on what grounds that authority can be sustained or challenged. And we need to empower students to question authority when necessary. Especially as liberal arts institutions, we need to build into our courses not only a greater ability to assess information, but a deeper understanding of the ways in which knowledge is generated and the legitimate grounds on which it can be challenged. Acknowledging that Einstein’s General Theory of Relativity reworked Newtonian physics does not prove the scientific method of knowledge-generation to be untrustworthy and that, in consequence, anything that Rush Limbaugh has to say about climate change is as valid as the findings of the Intergovernmental Panel on Climate Change. The above may be a handy exaggeration, but I would argue that we often fall short on one of the central tasks of liberal arts colleges: engaging students in the central (and different) ways our disciplines produce and authorize knowledge, and that a critical and historical approach towards knowledge-generation is a fundamental part of the on-going work of disciplines. For those who maintain that critical views towards “established” knowledge areas only enhances the arguments of “post-facters,” I would counter that not to question where and how knowledge is generated and established not only leaves the door open to those who would freely invent realities to further their interests, but leaves us poorly positioned to defend the work that we do in colleges and universities. At the end of the day, the best way we can enhance our students’ understanding of the difference between fact and crap is to make them aware of how knowledge is generated, and the ways it can be legitimately challenged. (3) Be the critics that we are trained to be. Emphasize, at every turn, evidence-based reasoning and the importance of transparency regarding sources and information. Help our students (and our colleagues) question not just the assumptions of others, but their/our own assumptions as well. As Cornel West observed, “It’s not a matter just of having the courage of our convictions, but the courage to attack our convictions.” We need to challenge arguments based on blind appeals to authority. We need to do this not just in our classes but in the broader decisions we make as an educational institution; not just in our institutions, but, as a national community of educators, from early childhood to higher education. And, as a community of educators we need to demand that local, state, and national governments make evidence-based decisions, are transparent about the evidence they bring to decisions making, and are open to discussion, information, and challenge. (4) Fight ideological and political blacklisting. A variety of news sources have reported that the Trump transition team “wants to know who at the Department of Energy attended domestic and international climate talks. It wants emails about those conferences. It also asks about money spent on loan-guarantee programs for renewable energy. … The Trump team questionnaire also asks… for the 20 highest paid employees at the department’s national laboratories.” The educational community is painfully familiar with ideologically inspired firings and the blacklist, and even the hint of retaliation against those who come to fact-based but inconvenient conclusions cannot be allowed to be normalized. It’s not enough to challenge false news in a “post-truth” environment, we must strongly defend truth and evidence, and those in the academy and outside who produce them. (5) Understand why many are pissed off at higher education – and do the work to show what is generating the most serious problems in higher education. Higher education leaders and the faculty in particular have not been forceful defenders of the transformative purpose of higher education, allowing the image to coalesce of college as a snobbish club where it costs a lot to get in, students spend all their time talking nonsense and hiding from ideas they don’t like, and, when finished, move back to their parents’ basement without a job or any “real” skills. We shouldn’t be surprised by the growing anger directed at the higher education sector. Like a carrot dangled in front of a donkey but always out of reach, a college degree is both a necessary means to a more secure future, and increasingly out of reach for a growing percentage of the population. One consequence is that the total outstanding student loan debt in the U.S. is $1.2 trillion, the second-highest level of consumer debt behind only mortgages. Since the 1990s, the number of black and Latino high school graduates who enroll in college has more than doubled. But three-quarters of that increase has been at open-access colleges. Meanwhile, white college enrollment has increased only at the nation’s top 500 universities. [There are about 4,600 institutions of higher education.] Thus, American higher education has evolved into a two-tiered separate and unequal system that fuels the intergenerational reproduction of white racial privilege. Put simply, as both the public K-12 system and the public higher education system become progressively non-white, they are increasingly starved of funding. If we support diversity in higher education, as we must, we also are called upon to support funding for that diversity, whether in state funding of higher education or federal funding of Pell and other grants. Whether at public or private institutions, we must fight for the right for higher education for all; fight to sustain the understanding that education is more than skills; fight to make K-12 and higher education a public good; fight to make higher education something that lessens, not increased, inequality in this society. (6) Be humble. 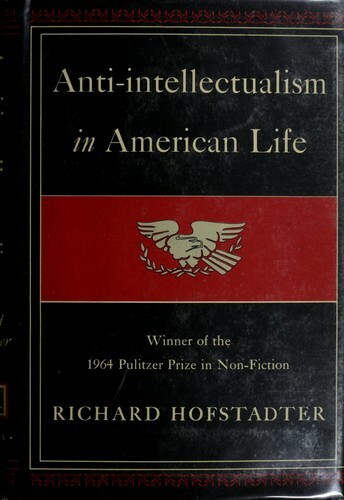 With the rise of the Tea Party and the advent of the Trump campaign and his victory, many commentators have returned to Richard Hofstadter’s classic 1963 study, Anti-Intellectualism in American Life. One of the more insightful recent reviews was written by the previously cited Nicholas Lemann in the Columbia Journalism Review. Lemann highlights two quotes from Hofstadter we should consider. Anti-intellectualism — Hofstadter wrote — is founded in the democratic institutions and the egalitarian sentiments of this country. The intellectual class, whether or not it enjoys many of the privileges of an elite, is of necessity an elite in its manner of thinking and functioning . . . . Intellectuals in the twentieth century have thus found themselves engaged in incompatible efforts: They have tried to be good and believing citizens of a democratic society and at the same time to resist the vulgarization of culture which that society constantly produces. It is rare for an American intellectual to confront candidly the unresolvable conflict between the elite character of his own class and his democratic aspirations. Intellectuals dwell in the realm of ideas and values, where almost nothing is ever right without qualification. So if anti-intellectualism is a natural aspect of a democratic society, humility ought to be a natural aspect of intellectual life. Our task is not to make ourselves likable to those who have turned their anger against us. Our task, as critics, is to lay bare the reality of what is happening and at the same time make what we do as educators both relevant and accessible, financially and intellectually, and doing it with humility and a sense of our own limitations. Our campuses must remain not just welcoming for, but fundamentally protective of, these communities. Whether becoming sanctuary campuses or underlining our opposition to racial or religious bigotry, particularly if such attitudes receive a covert or overt support from the highest offices in the land, our job as educators is to defend the inclusiveness of our project and to call out any attempts to challenge or undercut it. I need it — she continues — to disrobe the emperor in a way that all the pundits in the universe cannot. I need it to knee me in the back. I need it to humble and embolden me simultaneously. I need it to paint new worlds that help me understand this one. I need it to yank me out of the haze of the Internet and plop me smack dab in front of another human being staring into my eyes and making me uncomfortable. I need it to reacquaint me with truth. I need it to put marrow back in my bones. I need it to be fearless and maybe even earnest and I need it to come from…a place beyond strategy and semantics, a place of calm indignation, a place of spiritual redemption. I need art to remind me of the immediate danger and convince me of the safety available in collective rebellion. While it is art that Martin looks toward to find her voice and her community, it is to the liberal arts and to teaching that I look to “put the marrow back in my bones.” We don’t need to stop what we’re doing to confront the challenges of a post-fact world, we need to do what we’re doing better. We need to defend the task of liberal education as a means of creating an “intellectual engagement that fulfills our nature as thinking beings,” as Ramesh Ponnuru recently argued. But we also need to insure that the opportunities to do this are available and accessible to all. 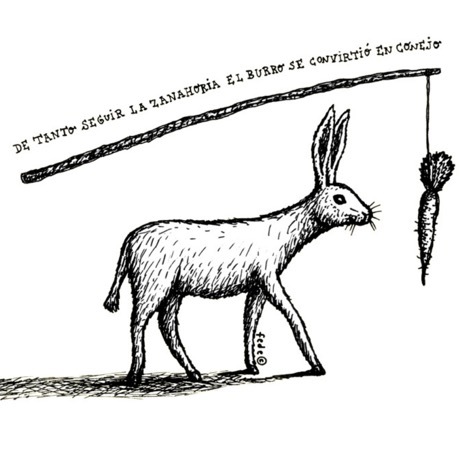 At the end of the day, the best way to confront a “post-truth” environment is to continue to do what we do, but to do it better, to do it with humility and conviction, and to do it with the knowledge that failure is unthinkable. How to Create an Effective Online Discussion Board.